Interesting look at two money show trials, a-la OJ Simpson race trial. These actors may have been real people but their stories appear completely (spook) manufactured. Were the trials even real? I sincerely doubt it. All staged to make it look like someone is watching the financial cookie jar. This entry was posted in Psyops on March 13, 2017 by ab. 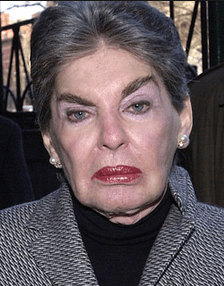 The nickname of Leona Helmsley (born Rosenthal) was Queen of Mean. From that point on, what else could possibly be real about her and her story ?